This singer has really surprised the world. While, less than two years ago, hardly anybody knew the school-girl who had just uploaded a home-recorded tribute to Usain Bolt, Mikayla Simpson aka Koffee is now a Columbia-signed artist with an international fan-base that grows daily! As such, of course expectations are high as to what the young lady is up to now. After her popular debut single Burnin on the Ouji Riddim that was released in late 2017, the next one dropped like a bomb: Raggamuffin (a Frankie Music production out early 2018) propelled the young singer to international attention, prompted Cocoa Tea to introduce her to the Rebel Salute, brought her in touch with Chronixx and Protoje and had even Walshy Fire reach out. 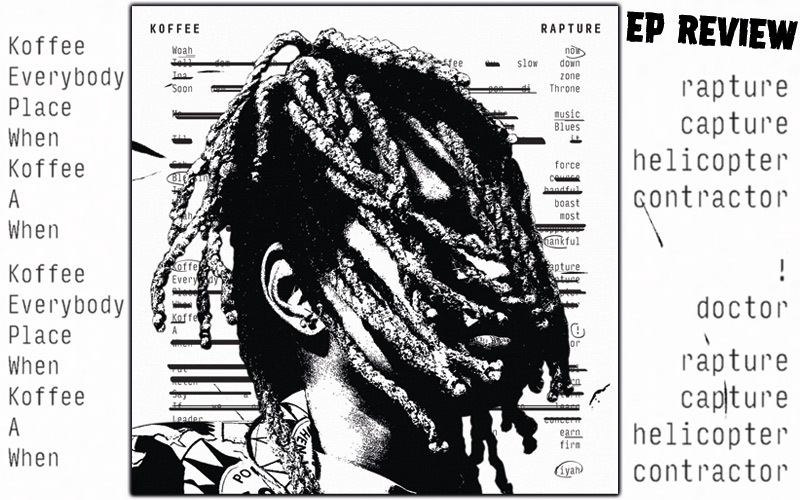 All these combined energies, and of course Koffee's innate talent and determination, gave rise to the EP called Rapture that has just seen the light of day. Producers like Teflon ZincFence, Lasanna "Ace" Harris as well as the above mentioned Frankie Music and Walshy Fire are part of the highly skilled task force behind this 5-track project, assuring a quality that not many newcomers command. Raggamuffin, for instance, has been dominating dances and airwaves alike for over a year now, combining that warm vintage Reggae sound with a modern twist that serves as a perfect stage for Koffee's versatile vocals. From the incredible low roll of its chorus to the high-pitched melodic delivery of the verses in the opening and title track Rapture, the singer moves with ease back and forth between words and notes and makes the joy the music brings her palpable, a joy that is instantly accessible as listener. And, oh, a lot of listening is taking place! Toast, the most successful single so far, has long gone through the roof. 18,7 million views on YouTube and counting, both lyrics and video seem to hit a nerve, especially with her peers. Hardly a street in Jamaica where not at least a one car or a one pedestrian blare the song on speakers or mobiles, and any stage Koffee delivers the track on, there's word-by-word sing-along happening. Gwaan wid it! In Blazin', the feminine energies are doubled when sweet-voiced Jane Macgizmo (whom you certainly remember from her 2016 release Babylon) joins Koffee in a laid-back chant about how they will set the world on fire - in a positive way! Starting with a heavy drum-roll that is almost drowned in the incipient bass, Throne then opens the door wide once more to Koffee's universe of unique vocals and trenchant lyrics. The accompanying video, shot by Xavier Damase, shows the little queen riding through the streets of Jamaica on the roof of a taxi, allowing for glimpses of the reality she was brought up in. Her wish to inspire and uplift her fellow Jamaicans is more than fulfilled, as a whole legion of non-yardies pledges allegiance to her music (just read some of the comments on social media!). In all this excellence, Koffee's approach to her art remains simple and natural. "Whenever I approach a riddim, I try to find the best way to compliment it, the best way that me and that riddim can fit in the same space at the same time perfectly", Koffee explains in our Yearbook-interview when asked about the songwriting process. May space and time allow for many more riddims to cross her way and be thus ridden, cause, Lord, her style is needed!